Trauma Bandage Quick and easy application and Self-application. Emergency Trauma dressings are Sterile bandages designed for first-aid to stop bleeding from hemorrhagic wounds caused by injuries in emergency situations. [EFFICIENT FEATURES] - Bandages come with Pressure Applicator to create direct pressure to the wound site. Also includes, Non-Adherent Pad - Eliminating pain of reopening wounds upon removal of bandage. Titanium Bonded Trauma Shears are used in Emergency situations to remove clothing, tape, bandages, seat belts, and more from injured party. [TITANIUM BONDED] - Strong and reliable material for all occasions. [VERSATILE] - Lightweight minimalist design, great for hiking back packs, trail riding, mountain biking, first aid kits, and IFAK's. 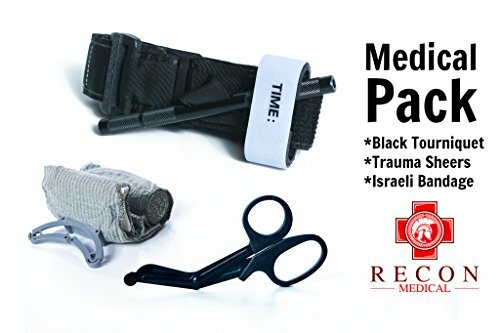 [LIFETIME GUARANTEE] - Make sure you only buy from Recon Medical LLC to receive your warranty card. Do NOT buy any other sellers under our listing as they will not come with a warranty and are not genuine Recon products. Your package will include its own guarantee card you can use to authenticate your purchase, and if you need, contact our 24/7 Support Team to get a free replacement, no questions asked! If you have any questions about this product by Recon Medical, contact us by completing and submitting the form below. If you are looking for a specif part number, please include it with your message.